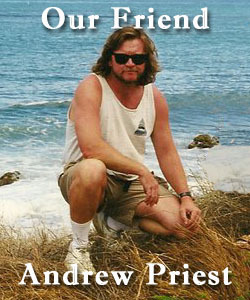 We lost our dear friend Andrew Priest on Tuesday, January 18th. There will be a memorial service at Culleys on Riggins Road in Tallahassee 2pm, Saturday, January 22nd; followed by a gathering at The Warehouse pub on Gaines street at 4pm. Thank you to everyone who has expressed interest in helping Tracie and Gloria. I have set up a schedule on Take Them a Meal so that anyone who wishes to can sign up to take either Tracie or Gloria a meal. At this time Tracie would like meals three times a week; Gloria would like meals only on Tuesdays. If this changes, Ill edit the website. You may be getting this and you live out of town or will be unable to provide a meal. Thats fine- Im sending this to many different email groups in the hope that I dont miss anyone. Please feel free to pass this along. And thank you for being a part of Andrews life. You can access the meal schedule by visiting TakeThemAMeal.com and locating the schedule by recipient last name (Priest) and password (Dude). This will work for either Tracie or Gloria. If you can, please plan on eating with Gloria or Tracie. Tracie especially will be feeling the effect of a lonely house so a little evening company may be just what she needs. When you call to set up a drop off time for either Gloria or Tracie you can ask to see if they mind you staying for dinner. I also know they both like wine.